Bookworms are peculiar little creatures. They’re very intelligent and sometimes intense and it’s kind of easy to accidentally OFFEND THEM SO BADLY THEY WISH TO BEHEAD YOU. So! Because I’m a nice person, I’ve written a list of ways to a) get a bookworm to like you, and b) keep them liking you if you are lucky enough to get their attention, and c) care and maintain them. If you have a bookworm in your family, pay extra close attention to this list. Then go forth and act upon it. BUY THEM BOOKS. Many books, don’t bother being stingy. Are you serious about wanting to win their affections or not? AFFIRM YOUR BOOKWORM THAT ALL THEIR READING HAS DEFINITELY MADE THEM SMARTER. This will encourage them to read more and also make them pleased and greatly reduce the risk of them smacking you in the head with a hardback. ACCEPT THAT IT’S “BOOKSTORES AND LIBRARIES BEFORE FOOD AND CLOTHES”. Because bookworms have priorities. Books are food, after all. DON’T ASK THEM “WHAT ARE YOU READING” IF YOU DON’T CARE. It’s annoying, okay? And bookworms know if you don’t care. If you’re just interrupting their reading time with mindless questions like what are you reading — expect TO GET A PAPER CUT AND THEN HAVE THEM POUR LEMON JUICE ON IT. So, just don’t. ALTERNATELY, YOU COULD ASK THEM “IS THAT A GOOD BOOK”? Because this is an excellent questions and a lot of bookworms do like discussing their feelings on a book. BRING THEM SNACKS. Sometimes a book is so intense they forget to eat. Or, well, they might eat, but it will probably be chocolate for their emotions. SO. Cook them good dinners. COMFORT THEM WHILE THEY CRY OVER THE DEATH OF FICTIONAL CHARACTERS. And by “comfort” I mean, a) bring them chocolate, b) give them a mop, c) fill a bathtub with marshmallows so they can comfortably and safely drown their sorrows, or even d) buy them a small planet they can rule to cheer them up. MAKE SURE THEY HAVE ADEQUATE SHELF SPACE. This could mean building shelves. This could be standing with your arms out and being a shelf. Oh but, small note: if you’re building the shelves, please make sure they’re STRONG shelves or you’ll have to a) fix it, or b) die under 3498 hardback novels. GO TO LIBRARY SALES WITH THEM. You can be useful and stand guard over their pile OR carry their suitcase of newly found purchases. SUPPORT THEM WHEN THEY GO TO AUTHOR EVENTS. Also, it’d be nice if you took flashcards and wrote little prompts on them (like “remember your name is Bob!”) and then stand behind the author and wave these cards so the bookworm, who is overcome by feels at this point, will remember how to look semi-intelligent. MAKE SURE THEY HAVE A COMFY PLACE TO READ. If you want your bookworm to thrive, make sure they are comfortable. That’s all I can say. IT WOULD BE GOOD IF THIS “COMFY PLACE” WAS A HAMMOCK, OR BED, OR CHAIR, OR THRONE. Thrones aren’t always comfortable, so shop wisely. BUY THEM BOOKISH MERCHANDISE. It is always appropriate to have mugs that say “Shh I’m Reading” and tee-shirts that say “Book Dragon” and to live in houses that are sculpted like books. IF YOU ARE JUST TOTALLY INEPT AT UNDERSTANDING THEIR BOOK FANGIRLING, MAKE SURE THEY HAVE INTERNET ACCESS. Just accept that you have failings, okay? Make sure they have actual bookworm friends to debrief with and your bookworm will be so much happier. YOU SHOULD PROBABLY WORK OUT AND BE FIT. Because, as I said, you will be the packhorse for all book-buying excursions. IF YOU ARE TOO PUNY AND WEAK, THEN BUY THEM A KINDLE. This is the cheaters way out, but, well, one must do what they can do. BUY THEM BOOKS. Did I mention this?? Oh well. It needs be noted copiously. It is the way into a bookworm’s heart. oh bookworms! did i miss any??? are there any other steps that are crucial in caring for a bookworm?? do your family/friends/local reptiles follow any steps on my list?? Am I the first commener!!!! That should actually be… AM I THE FIRST COMMENTER?!!!!!!!!!!!!!!!!!!!!!!!!!!!! I was so amazed I typoed all over your blog. I’m sorry, let me clean that up! And yes, buy us all the books. My son knows this, so all is good. It is just fabulous that you have your son well-trained. I’m trying to train my family, but they fail at a lot of these. My sister is VERY handy for standing guard over piles of books at library sales though. YES TO ALL OF THIS. Accompanying them to the library and snacks and buying books for them it should be pointers for my family). I do this for so many other people! Like my brother refuses to read unless I tell him what to read and check it out from the library and return it and carry it for him. I’m pathetic so I do this. Happy Indian independence day! Also, we haven’t heard from atticus lately. what has he been doing? Your family is MOST WELCOME for these helpful tips from me. hERE TO HELP, AS ALWAYS. My sister used to be a big reader but now she neeeever reads and I basically have to smack a book in her face to get her to read. My recommend list has exceeded 100 for her and still she persists on studying instead of reading. Sheesh. OH ATTICUS IS GOOD. He is a ratbag and loves to steal and eat my origami but otherwise he is my loveable fluff ball. I need to put more photos of him up on my weekend-ish posts! I want an entire post about Atticus! OH OH YES I GET THIS. It depends on the book right??? Sometimes others can help BUT SOMETIMES THE BOOK IS TOO GLORIOUS TO BE TOUCHED BY MERE MORTALS. EXACTLY. We bookworms should run little courses on how-to-properly-treat-bookworms. *nods* That way we’ll never be misunderstood again. OMG YES. THE BOOK THIEF. *Cries just remembering* I saw the movie first (yes, I know, for shame) so I KNEW what was coming when I read the book…but I still bawled. IT WAS RIDICULOUSLY CRUEL AND GET ME THAT MARSHMALLOW BATH TOO. I think I’ll need a marshmallow castle to live in actually. Pretty comprehensive! I would also add “if they recommend something, READ IT or crush their soul”. OMG. Yes. That is a very needful addition. Heh, nice post! *giggles* I’ll never be short of books to read, that’s for sure! I’ve been feeling smug that my tbr is finally about to dip below 500 physical books for the first time in many years…then I think, I STILL have 500 to read! Plus my wishlist of books yet to be bought!!! Then I feel overwhelmed and dizzy, and download a few more to settle the nerves…! It is a bit subtle, sadly, I always write SUCH SUBTLE POSTS DANG. September is coming tho. We need prepare. My TBR pile is getting low and my family keep telling me that that doesn’t mean I need more books. Apparently, I only need books when I run out completely. I don’t know what planet they live on. Well your family is clearly wrong and you are not getting enough support from them. I SHALL SUPPORT YOU. GO GET MORE BOOKS, OKAY?? YOU’LL FEEL BETTER. I feel much better that my TBR is back to 10 books. :’) 3 was just too terrifying. This is just the perfect post, hahaha. And that llama gif made me laugh so hard! And the bear <3 I LOVE THE GIFS. And the text. And things. All of the things. Stuff. I like books. Hmmm. I shall send this to my parents for immediate study – although they do have the ‘Buying Books’ thing down. AND THEY BOUGHT ME (US) SOME NEW BOOKSHELVES *DANCES FOR JOY*! 1. Be prepared to be dragged round libraries and bookshops for hours. Only suggest you leave if the bookworm has in excess of four books. 2. Always carry a book you know they will like and have not read, in case they finish the other one unexpectedly. 3. NEVER INTERRUPT READING TIME. Except if homework has to be done, seeing as sometimes reading makes us forget this. Thank you for being so useful and brilliant, Cait. I would never have thought to instruct my friends / family on this. EDUCATE THE WORLD! MAKE SURE THEY KNOW THESE IMPORTANT THINGS. HUZZAH! Ohhh new bookshelves?! LUCKY YOU!! I am in the midst of a convincing the parental units I need more shelves. Also your additions are golden. Love this post! Given that I have books, internet access, and a Kindle, I suppose my family isn’t totally inept. We need one of these lists for writers, though. Because writers make significantly less sense than bookworms. As always, lots of fun, Cait. I need to share this to my personal FB page! AWK, thanks, Elizabeth!! ^_^ I’M SO SO GLAD YOU LIKED IT! I forgot! My family often has to go to the library to pick up things I have on hold and then drive out of their way to bring them to me or pick up some to return. This started during the horrible snows we had last winter. They were getting 6-12 books each time! Alas, I feel as if our tears altogether will drown this planet one day smh. All these character deaths have emotionally traumatised me. WE WILL NEVER BE THE SAME WAY AGAIN. YES. DEIFNITELY FRAME IT. And then mail it to all family/friends/reptiles so they too can be educated. YES TO THIS. Actually, I don’t need a packhorse much, because of the horrid lack of libraries here. So I either order books from the Book Depository and they are delivered to my door (YAY!) or I read in bookstores and saunter out without paying (or a book. sigh.). Although there was that one time when I was rewarded with books for volunteer service and had to smuggle them out without being crushed by the weight. THAT WOULD BE SUPER HELPFUL AT AUTHOR EVENTS. Like, I have never been at an author event, probably will never be at an author event, but I would totally lose my speaking ability? Okay, I lie. I have been at author events, but those were for Chinese authors who write short stories with no dragons or swords. Hmph. Your idea of bookworms seem rather violent, though. Whacking people with hardbacks? Paper cuts with lemon juice? Thrones? … you’re absolutely right. We’re a violent bunch. You seem to be extraordinarily obsessed with small planets and islands. I’ll keep that in mind when I hear Eris has been colonised or someone bought out a Pacific Island. PS: I feel like this post would make a wonderful Dumb Ways to Die parody. Being a bookworm is a gym workout all on its own. When I library, I have to tackle my nephew/niece’s 395082 books AND my own and omg I know what it is to be the packhorse. This packhorse needs a packhorse. Why…why would anyone write a story without a dragon or a sword? WHAT SILLINESS IS THIS? Me? Obsessed with something? PFFFFFFT. Have a great weekend and happy reading. I totally agree with all of your points. We are precious and fragile creatures and must be handled with care. If I were to add one, I’d say that if you borrow my books you will bring it back to me in the exact same condition (seriously, I know when a cover crinkle wasn’t there before) OR I WILL DESTROY YOU AND ALL YOU HOLD DEAR WITH MY LASER EYES!!!! Haha! So true. Thanks to Goodreads I’ve accumulated a healthy TBR list and started asking for those books for Christmas and birthdays. My parents are kind of rolling their eyes at me. lol! They’re useful presents to me!!! THEY ARE USEFUL!! No one complains when we ask for socks, so why not books?! THEY’RE SO MUCH MORE USEFUL AND PRETTY. EXCELLENT POST, CAIT. I WOULD LIKE MY FAMILY TO READ THIS SEVERAL TIMES SO THEY CAN ADEQUATELY CARE FOR ME. Especially proper throne-buying etiquette. I mean, that sort of stuff should be taught in every school. It would be acceptably subtle to, like, print it on bright paper and then plaster it across every wall of your house. Just to help with the education processes, amirite? *sends this to everyone in her life* Great post Cait! It’s not easy to keep us bookworms happy, so it’s good that there’s now a guide out there for other people. YESSS. That is a must-add to this list because omg, what is it with putting time frames on bookshop visits?! YES. Basically #18 be their servant/slave forever because books. I would just add, provide emotional support during hard times in the middle of particularly cruel books and don’t get in their way when they are moving into the climax. Yes, we need shoulders patted, chocolate, and possibly to be given small cuddly kittens for therapy. How about “Let them do their thing in the bookstore and not say, “I really don’t want to hang out in a bookstore so we’ll only go in if you can make the trip in under five minutes.” Uh, I need five minutes to just look at the bestsellers. So I’m going to ignore your set time limit so TO BAd! AGH YES. That is a definitely must-add to this list. Staaahp putting time limits on bookshop visits, humans. DON’T BE CRUEL TO US. YOUR FIRST POINT. My family always asks me what I want for my birthday and I always tell them: BOOKS. And they look at me weird and I’m like, “no, seriously.” And they never take me seriously…. And also, my parents recognized I needed more shelf space, so my dad and I went to the hardware store and built a bookshelf that covers AN ENTIRE WALL of my bedroom. It’s perfect <3 And by now it's full…but yeah. OMG MY FAMILY TOO. WHAT IS IT WITH THIS?!! *wails and stamps feet* They always say “but you already have so many books” YES. SO? I NEED MORE?? No one complains when you need more socks or anything. Stupid socks. You always lose half of them, anyway. You can’t lose half a book. Therefore: books > socks. Yes! Yes to all of this! And also, be prepared to shut your trap or you will get ignored and then feelings get hurt. It’s just best to leave me be while I’m reading! Unless your asking if I want one piece of chocolate or 2. However, you will quickly learn that the answer is always 2. The only acceptable interruption is totally “do you need chocolate” or BETTER YET, just leaving chocolate quietly by our sides so we can eat it and not even needing to interrupt. I swear this should be a universal handbook for anyone friends with a bookworm XD. This entire post is SPOT-ON with our precious bookworm needs. Why tend to your own? You have ours to take care of. If I ever get a boyfriend, I’ll need to pull this out and quiz him on this. And of course if he does all of it, I’ll love him forever because FREE PACKHORSE. We should totally make 40 feet high posters and plaster them all over the world and EDUCATE THE UNIVERSE ON OUR NEEDS. I’m sending this to my boyfriend! GOOD THINKING. Get this boyfriend trained early as possible. Oh, Cait, you are far too awesome. I think it would also be very good for someone with a bookworm friend/family member/boy/girlfriend to be aware of ALL BOOKISH EVENTS EVER, so they can inform their bookworm in case they missed something. If they’ve already bought tickets and arranged time off work for the bookworm to attend the event, even better. Also, do a Disney’s Beast and give them a huge, amazing, beautiful library. Also, make themselves scarce so bookworm can read, because people are disctracting. Never interrupt. *flips hair majestically* I can’t help it, Jo. It’s just who I am. YES. There should be bookish calendars available for unknowledgable family/friends/reptiles to read so they can be aware of the IMPORTANT days of our lives. *nods* And make that Beast library have those ladders too. And also talking furniture. GO THE WHOLE HOG! I love this haha. I should send it too all my family memebers. YES YOU SHOULD. EDUCATE THEM. AWK. That just makes me fjadskla intensely excited to know you like the post so much! 😀 Thanks, Annie!! Agree with everything except people asking me, “Is that a good book?” while I’m still in the middle of reading it. Because until I’m done with it and have processed all my thoughts on it (and sometimes even then), I am not able to give the short and simple answer people are looking for (“Oh yeah, it’s great,” “Eh, it’s OK.”) For me a better question is “What do you think of it so far?” But only if they actually want to hear the answer. Same with “What’s it about?” A good book cannot be summarized well in a single sentence, and if they’re asking me to interrupt my reading to explain the book’s premise and/or my feelings on it, they better actually want to know and not just be trying to make conversation, because why are you trying to make conversation with me when I am clearly reading?? Oh oh I do like the “what do you think of it so far” instead. that’s much wiser. I usually know how I feel about a book and what I’m going to rate it from like pg 50 BUT SOME BOOKS STILL SURPRISE ME. And it’s so annoying when people interrupt to ask but don’t really CARE. Grrr. I would like a personal Book Buyer, please and thank you. These are great tips that everyone should remember. I also think important book release dates should be universal holidays so no one has to go to work or school and can instead stay home to binge read. Yes, absolutely. Or at least there should be several days off a year and mass books should be published on those days. Maybe the first of each month is an automatic holiday + book release day + free ice cream. Ooh, I like the edition of free ice cream. We have to keep ourselves fueled, after all. This post is AMAZING!!! It is also filled with THE TRUTH!!! And it has also made me realise that I may just date the greatest guy ever, something I sometimes forget after almost 9 years together. He does all these things. He brings me food when I am reading and have forgotten to eat for hours – even going on treks to the shops when I suddenly get a craving for a particular sweet. Then he buys me books, books, books and MORE BOOKS!!! For Christmas, and birthdays, when I am sad, when I am happy, as a surprise gift or for any number of reasons. He is the pack mule on my book buying excursions or author events. He comes to author events with me and takes any pictures I want and calms me down when I freak out about meeting them – he does all this, whilst having no interest in reading or authors, or sitting for an hour listening to an author talk about their books. And he allowed me to turn our spare room into my own personal library!!! 🙂 Awwww, thank you, you have made me realise that I am a rather lucky lady. BUT ALL PEOPLE SHOULD DO THIS FOR THEIR BOOKWORMS! Parents, siblings, partners, friends and random strangers. Appreciate our love of books! BRING US FOOD!!! <— Clearly the most important thing here! YES I THINK YOU HAVE THE GREATEST DUDE ON THE PLANET, OMG, GO YOU. AND GO HIM. FOR BEING SO INCREDIBLY BOOKISHFULLY USEFUL. *nods* And he buys you surprise books?! Zomg, Charnell. I don’t even think he needs training with this list. We shall just focus on training the pesky family, right?! RIGHT. eRGH YES. Postage is the worst thing in the universe. And it just keeps going up too. :O It’ll be the death of me someday. And gift cards ARE glorious. It’s so much more awesome to pick whatever you want, right?! These are all very nice things, and I think I would be pleased if my family did this for me. XD As it is, though, with my way-more-bookwormy sister, I think the kindest thing you can do for a bookworm is to just leave them alone and give them time to read, because reading is not an invitation to start a conversation, you know? Everybody needs to read this. My parents need to read this. The president needs to read this. There needs to be some sort of national holiday for buying your loved ones books, and giant thrones. Bookintines day??? Bookmas???? idek ???? umm obama? or you reading?? ohgosh, that bear looks immensely pleased with himself for finding a chair that suits him. WE SHOULD MAKE MILLIONS OF POSTERS THAT ARE 40 FEET HIGH AND PLASTER THEM ACROSS THE UNIVERSE TO BETTER EDUCATE THE WORLD. I agree, tho!! And like, no one gives books sections on the news (sports get mentioned but not who’s got a new book deal?!) and there should be book holidays and cake flavoured books and just SO MANY THINGS. The world needs to change. ACK, CAIT, THIS IS BRILLIANT. So true! It would be very very lovely if I got a marshmallow bath every now and then. Also: ALL THE BOOKS. It would be very therapeutic, I think, especially after a horrific book. Plus you could eat the bath and what’s not to love about that?! Do not tell them that libraries are a) irrelevant to a modern age or b) a waster of money. I’ve argued with waaaaay too many people about the value of libraries, and it does put them on my good side, tehe. OMG YES. I’ve heard people say “no one uses the library” and steamed with indignation. Whenever I go to the library there are DOZENS of people there. Perhaps this is why the Kings of Westeros do not last very long. No comfortable throne to read in. Kings of Westeros…hands of the king…ANYONE REALLY. I think they need to remodel their throne a bit. For being so wanted, it’s sure pitched as uncomfy. YES YOU ARE RIGHT. There are so many kindle books I wish I owned a physical copy of. It’s also like you get to look at them on a physical shelf and admire and remember how much you loved it. I ADORE THAT MOMENT. I know! I don’t even KNOW why I bought A Court Of Thorns and Roses in Kindle when I anticipated that I’d like it. I actually don’t know why I buy ANYTHING in Kindle. What’s the point of a book you love but can’t see or hate but can’t give away? This was so funny! But also so true. I am a weakling and always need somebody else to carry my books for me after a particularly large library haul or a long day at the bookstore. Wonderful list! This is definitely the way to my heart. If they ask me “is that a good book?” They’re guaranteed to expect 30 minutes of fangirling and/or ranting. XD also SNACKS are a must. Hahaha. SNACKS ARE IMPORTANT FOR SURVIVAL. This pretty much sums it all up. 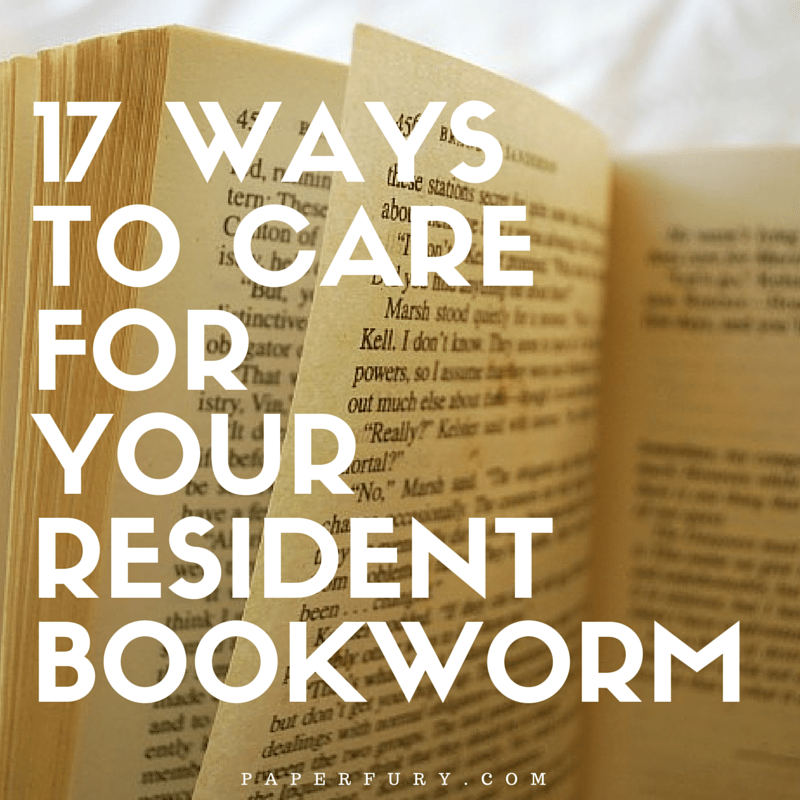 A comprehensive guide to bookworm care! My immediate family are also all bookworms, so the annoying what are you reading question is always avoided, but it means there is no one to buy me books, because they’re all buying themselves books. The horror! I’m forwarding this to my boyfriend immediately.. Not that I don’t love the gifts, in fact he did get me the Song of Ice and Fire series for Christmas one year. Makes him a keeper in my book 🙂 BUT more books are a must, never have too many..
NEVER TOO MANY. I ABSOLUTELY AGREE. And if he’s already buying you series then, gawsh, you have a good boyfriend. KEEP THAT ONE. To be discreet, I suggest printing off huge posters and then highlighting them in bright colours and sticking them on every wall of the house. YET IT IS DISCREET. I didn’t say stick them on the walls and ceilings too, see?! Start small. WELL THAT IS JUST GLORIOUS. You have a fairly wise gent then. Kaitlin @ Next Page Please! 1. Having a book fortress made securely out of their favorite books because the zombie apocalypse will happen, and they need someplace SAFE. 2. Be prepared to pay for flights to cart your bookworm (book nerd/book lion/etc) to conventions once they start really participating in the online book world so they don’t get sad that they’re missing their online friends. 3. Don’t bring your book person chicken soup when they’re sick. Obviously, bring them a book from their TBR that you know they haven’t bought yet. 4. Guard your book person from vagrants that may approach them to make small talk when they’re reading, so that your precious book worm will never be angry. Oh, and I tagged you in the Creative Blogger Award, it should be right on top if you get to visit the blog, and if you don’t it’s fine, just telling you! I like your additions, particularly #1. Make sure the fortress is made from marshmallows so they can eat the walls when hungry. *nods* And Im’ sure zombies would be repulsed by marshmallows so insta-win. *whispers* I’ve never gone to a book event. NOT EVER. I would add one: Make sure they have an adequate supply of their favorite drink on hand so they won’t be interrupted while reading. YESSSS. In fact, make them their favourite drink and bring it to them on a golden platter. Right now, shelf space is a huge problem for me. But your post was so brilliant–my problems are solved. Now all I need to do is find someone strong enough and willing enough to be my permanent bookshelf addition. Cait, YOU’RE A GENIUS. And when you said uncomfortable throne, all I could think of is how the people in Game of Thrones are basically fighting each other for the chance to sit in the super-uncomfortably, slightly deadly sword chair. I need that one, I think. Absolutely. How dare anyone interrupt reading. Plus if zombies come, you have a weapon automatically ANYWAY so it’s not like you need to take immediate action. I would be the one reading through the apocalypse. HUMAN BOOKSHELVES. You are so welcome. YES. I was thinking of the uber uncomfortable Iron Throne as well, tbh. I want one too. Let’s just say that was such good post I had to share it on Google Plus. And maybe even Twitter. So, you should be happy because this is a rare occurrence for me. (Not that you wrote a wonderful post, but that I’m actually sharing a post because I hardly do that.) Bookworms… Such a happy little creatures… Most of the time. “DON’T ASK THEM “WHAT ARE YOU READING” IF YOU DON’T CARE.” AHHH, THIS. Oh my gosh, this infuriates me. I despise that glazed over look people get as soon as your mouth opens and asdfghjkl. Like, I wrote about this once, I was asked that question at a job interview and she just STARED at me after I answered. Not only did it make me uncomfortable, it was almost like she didn’t even believe I liked reading. ANYWAY. I’m lucky enough to have a friend that does most of these things, she even drives me to various libraries around town and I am eternally grateful. Fun post! I need people to carry my books all the time. Especially when I’m coming out from the library because OMG I have very wild intentions whilst at the library and I need a slave human to tote my books at times. The only things I can think of that you are missing are get them some pretty bookmarks, so they don’t just use tissues, hairbands, and whatever else is lying around…. and give them time to read…. oh and buy them books. I TOTALLY FORGOT BOOKMARKS. *facepalm* I constantly use my kindle for a bookmark. The irony is strong. I never get books for birthdays or whatnot because people say “but you have enough” GAH THEY JUST DON’T UNDERSTAND. I don’t ask for much on those occasions I don’t get if you wont give me books am willing to take gift cards or money. Then I’ll just buy my own. Do not speak the word Umbridge here. I AM STILL NOT OVER MY ANGER. 2. Never (ever, ever, ever) disrupt them while they’re reading. 3. Do not stand behind them and make them super self-conscious by reading their book out loud over their shoulder. Especially in a public place with lots of people. OMG ABSOLUTELY. I constantly am told to just “Get rid of books” and blood was nearly shed over it, but I maintain that I’m a (mostly) nice bookworm and resisted. Gah, but seriously. BOOKS ARE NOT TO BE GOTTEN RID OF. Reading books over shoulders is evil. It’s like the greats sin of the universe. IT IS SO SO WRONG. Seriously, I wish I had a turtle shell so I can just hide when they do it. But that’d probably make me stand out more… and I’m a shy bookworm. It is SO troublesome to try and find a good throne that is both comfortable and elegant, not to mention royally fit for moi. May I suggest a throne made out of books? That seems like a good solution to me (and we all know that my opinion is #1 priority). I also wish for someone to buy books for me and make sure that I ate more than just Cheetos for every meal, okay? Is that too much to request? AGH. I KNOW. Good thrones are just hard to come by and who wants to settle for something subpar? NOT I. Is it wrong if I send this to everyone I know? Just like, a general “How to Shannon” guide? I mean, they need to understand these things! I want a hammock! My goodness, that would be ideal. I imagine the throne would be too… upright. Think about royalty- I see them doing a LOT of things, but I am never catching them in the midst of a good YA book. No no you really SHOULD send it to everyone you know. Preferably around Christmas/birthdays because some people are really dense at catering to all a bookworm’s needs. I think a reclining throne could be nice. Like the one in an Emperor’s New Groove. OR OMG HAVE YOU EVER SEEN THE PHOTOS OF READING NETS THAT GO AROUND THE INTERNET??? I want a reading net. I should sell how-to-be-intelligent-at-an-author-signing flashcards, really. I would be rich. Oh, but there is only ONE world ruler and it is me. YES TO EVERYTHING! And making sure we have plenty of bookmarks, and DONT MOVE OUR BOOKS OKAY THANKS. THAT GIF IS LIFE BASICALLY. YES YOU MAY. Or frame it on the wall. Or write it out in small pieces of confectionary. ANYTHING TO GAIN THE POPULACE’S ATTENTIONS, TBH. I AM BACK FROM MY VERY HOT HOLIDAY, AND AM ARMED AND READY WITH WIT AND WORDS TO COMMENT ALL OVER THESE DARN BEAUTIFUL POSTS YOU HAVE WRITTEN WHILE I WAS AWAY. 1. DO NOT SAY: no you cannot read and eat you’ll get food all over the pages BECAUSE NO I WON’T, I am skilled in this art, and would never ever damage my books anyway SO YOU STEP AWAY. 4. If you do borrow a book with PERMISSION, do not damage it otherwise when it is returned to me you’ll find you walk away from my house missing a finger, or toe, or just – a whole limb. 5. DON’T INTERRUPT ME WHEN YOU CAN TELL I AM ENGROSSED IN A BOOK TO SAY SOMETHING MUNDANE LIKE: your room is a mess, tidy up before you read. ZOMG, YAAAAAY YOU ARE BACK! MY LIFE HAS BEEN IN SHAMBLES WITHOUT YOU, HAWWA. IT TRULY HAS. And yes and yes to all of your additions. Although I’m NOT skilled at eating-and-reading. I get books messy. 😐 Sometimes I’m a horrifically messy eater, idek, didn’t my parents raise me to be neat? I blame them, naturally. FADSLJKLDSJA REALLY????? AHHHH!! THIS IS GLORIOUS NEWS AND A MIDLY GLORIOUS DAY SO I SHALL JUST PAT YOU, PROBABLY, AND THEN FEED YOU CAKE. **gasps*** I NEVER KID. I AM ENTIRELY SERIOUS 10000% OF THE TIME. hehe. xDXD Awk! I’m so glad you liked it, Stephanie! You probably do have a terrific family. I quite like mine, though, because they feed me cake even if they don’t take me to author events…they take me to book sales so there’s SOME win there. Lol. XD I wish more people bought me books and brought me snacks while reading. ROFL about being weak and getting them a kindle. For realz. Hardcopies are the way to go! I just want people to buy me books all the time, is that so wrong? Haha. But seriously, I get asked at Christmas: what do you want? “Books.” Or “you’re so hard to shop for.” HOW AM I HARD TO SHOP FOR JUST BUY ME A BOOK AND I’LL BE HAPPY. I wish people would actually be genuine when they ask what I’m reading, because most of the time, they don’t truly care. And if they ask me that other question, I’d be happy to discuss with them! I might make them feel slightly awkward and weird bc of my FEELS but oh well. Aw, the “support them at author events” one! I have to admit, I wish I had people who actually want to go with me to these events but it’s hard to get support for that (especially if the event is so far away). YESYESYES to all the bookish merchandise! I’d also like all of that for Christmas and my birthday. Books + bookish merchandise. The best presents. IT IS NOT WRONG. It is completely logical. *nods* I mean we buy food all the time, why not books?! AND ME TOO WITH CHRISTMAS TIME, OMG, WHAT IS IT WITH PEOPLE AND THINKING THAT WHEN YOU SAY “BOOKS” YOU DON’T MEAN BOOKS?? I DO MEAN BOOKS!! Yes, absolutely agreed. It’s annoying when people ask about books and don’t really care. I always get this “bored vibe” when I start going on about books BUT HEY THEY STARTED IT. I’m currently easing my boyfriend in to the life of dating a book worm, he is coping ok so far. I may have freaked him out slightly with the amount of Harry Potter clothing I wear (enough for one item every day of the week, hells yeah!). Love this post. I do agree, thrones are not very comfy but I do like the idea of the bath filled with marshmallows. Will have to start stocking up on them for my next emotional read! THIS LIST IS PURE PERFECTION! And I need to show this to everyone in my life! Fortunately, my parents have gradually learned what’s it like to have a bookworm daughter, and are slowly getting better at being good supportive mom and dad, but MY BEST FRIEND BADLY NEEDS SOME ADVICE! I often wonder how we are best friends, tbh! She hates books, doesn’t accept “I have to read” as an excuse when I cancel plans, never understand my burning need to buy all the books, whines every time I want to stop at a bookstore and most of all thinks that READING IS A WASTE OF TIME! I either need to show her this list or find a new best friend. My husband has perfected his bookworm love and care status by looking after me when I fall asleep late at night while trying to finish a book. I never fell asleep reading when I was young! He removes my glasses and puts them away, and puts a bookmark in my book. This comes under the heading of how to care for an aging bookworm. Oh yes please, I love this list! I am very much giving this to whoever ends up being my husband in the future so he can take not of everything here. Especially the first and last points xD Ahaha but I loved all of these! Especially the mention of bringing them snacks. They should probably also make sure we are asleep at the intended curfew because we could end up staying up all night with a very good book to keep us company. This whole list, omg. I have yet to have friends or family accompany me to book/author events, but hopefully some would at least have the heart to be my chaperone because I’d probably end up fainting or lost like a puppy. Thank you for this post. Now, I have to end this comment because I’ve got a lot of “Yo, check out this funny article I read about bookworms, I mean really, it’s sooooo accurate, I hope someone does this for me” passive-aggressive messages to family members and friends. Hah!